So, I’ve now left what may have been gardening utopia, and moved to sunny–and I mean brutally sunny enough to warp a bottle of dishwashing soap on the sink kind of sunny–Las Vegas. Our hot days are pretty much beyond what human imaginations can conceive of without having been here (have you any clue what 117 feels like), and our cold days feel deadly because of the wind and low humidity. My God, the humidity is low here, like my new best friend is cocoa butter lip balm and I will slather three different types of body creams, oils, and lotions all over me every single day. Black Krim: I chose this heirloom solely because it’s my favorite every single year. It has its own problems, and if I’m to guess, they will be worsened by my brutal conditions, but I’ll go down trying. 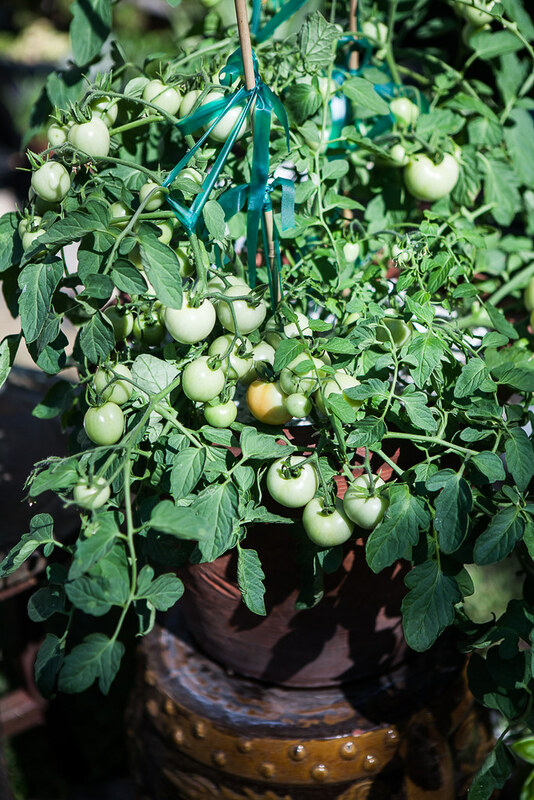 Of all the tomatoes I have personally grown, Black Krim makes the best tomato sauce, so come what may – we’ll be shooting for success here even if I have to move the plants all over the year all day long. Black from Tula: I have not grown this one before, but I bought seeds a few years ago, and figured why not? For what it’s worth, the three-year-old seeds germinated quickly, so yay for Baker Creek Heirloom Seeds. Black Cherry: My usual cherry tomato container plants are Maskotka tomatoes, shown below, but I’m out of the seeds and I’ve heard good things about Black Cherry. Speaking of Maskotka, this is a great little tomato plant that will produce to your heart’s content. The tomatoes are really sweet and fleshy, low acidity, and perfect as little snacks while you sit on your patio. That’s exactly where I always had 1-2 plants growing, and almost all of it would be eaten while sitting there. For bringing indoors to actually cook with or put in salads, I’d choose a larger variety. So I am really curious how the Black Cherry tomatoes will compare. It’s purely coincidence that all the tomatoes I started are ‘black’ varieties, though in hindsight, perhaps the darker skin color makes it worse in this heat. The seeds were planted on 2/4, and all were germinated within 7-12 days. My pepper seeds are mostly all germinated with a few stubborn ones still lurking underneath. I have a few Aji varieties coming up now, and my Datil peppers appear to have gone on vacation. These, unlike tomatoes, are not reliable on when they will germinate. With new seeds, I tend to plant two and at least one will pop up. When I use seeds that are from past years, you can never tell how many are still viable and will germinate, so just in case, I’ll plant four to increase my chances of getting some. More often than not, I end up with 3-4 in the same pot. That said, seeds do expire at some point, so there’s no need for average households that don’t plant hundreds of the same plant to be stingy. If you’re simply wanting one plant, then you can go ahead and snip the green leaflets (cotyledon) off the ones you do not want and they will die off. In the above case, I’d keep the one closest to the camera and snip the rest right about this time. But in my case, the larger pot helps because, as shown below, I end up wanting to plant all of them despite intending to only plant one. I was a little concerned because I felt like it might be a little too rich for seedlings (or “hot,” as the gardening community might say). You see, seedlings have all the nutrition they need in the seed and don’t need additional fertilizer until they truly begin growing. Being germinated in a soil that is quite full of organic components like bat guano seemed a bit much, but it was worth a shot–and as it turns out, worthwhile. That said, if you have ProMix HP available, I’d still recommend that because (1) it’s pure, and (2) it’s completely void of any nutrients, which leaves everything the plants get under your control. Also, Promix HP doesn’t have bark, which I hate in seedling mix. (I mean, how is a little seedling supposed to push through a piece of bark? Answer: they somehow manage, but it still feels illogical.) But all in all, I’ve been pleased with Ocean Forest. Right now, most of my plants have been repotted into this for the coming summer. When preparing the soil for your seed trays, I recommend wetting down the soil completely first. Then take the wet soil and fill the pots, tamping down lightly to fill completely but don’t push down too hard. Then, take the shower at the sink or a hose, and water it all in so the soil settles. All the pots have drainage, and most seed starter sets come with a drain catching tray. Once the water has drained through, your medium is now ready for seeds. I take a chopstick and make a shallow hole in the soil, then drop in a seed. Repeat this for as many seeds as you plan to plant. Try to keep to a pattern like a triangle or square so you have some idea of where the seeds are. THEN MAKE SURE TO LABEL THE POT. IMPORTANT: Depending on your location, you’ll find that tomato seeds don’t germinate until the ambient temperature is about 65-70 degrees, and pepper seeds absolutely refuse to pop up until about 75 degrees. Because of this, if your area is smack dab in the middle of winter, or if it’s cold in your house where you’re starting the seeds, then you’ll need a heating mat below the starter tray to warm from the bottom up. Some people use the top of their fridge, but I highly recommend this small investment that ensures success quicker, or else you’ll be the fool staring at wet mud for months on end. Heating Mat: it’s only $14.99, so this is not some high end one, but it works perfectly–just plug in and you’re good to go. This is the one I use, and frankly, given the short seed-starting season for me, I don’t need anything better. Make sure the mat size fits your tray size. From this moment to transplanting, you have to make sure to keep the soil damp/moist, not soaking wet. You might end up flooding your tray accidentally once or twice, which won’t kill anything, but if you repeat that practice, your seeds will rot before they sprout. DAMP, MOIST, but NOT WET. It’s an artform. I tend to carefully water the top so the seeds don’t move, or better, fill the tray with water until all of the pots look wet after 20-30 minutes by sucking up water through the draining holes. But that is only 1-2 times per week. The rest of the time, I take water in a spray bottle and spray the top daily to ensure the top stays moist, because that moisture will help awaken the seed and compel it to germinate, along with the temperature. Each pepper variety differs on their average time to germinate. Generally speaking, the hotter it is, the longer it takes–but not necessarily always. When transplanting the seedling, many people use nice pots, etc. I don’t — this is merely home to the seedling until it goes to its final pot, which is whenever the weather is warm enough overnight (or 50 degrees consistently), and it’s large enough to be transplanted into a big pot. Don’t waste money on an actual pot when a plastic red Solo cup or styrofoam cup works perfectly well. First, fill the cup with soil and tamp down. In my case, the soil was already mildly moist so I didn’t water first, but if your soil is ridiculously dry–then I suggest you water your soil and make sure it is soaked first, then squeeze it dry, THEN fill the cup and tamp down. Take your chopstick and make a large hole in the middle, ensuring it’s at least halfway down the height of the cup and wide. You want to make sure the seedling, once removed from the starter pot, doesn’t experience any other trauma in the transplant process. Most will tell you not to remove the seedling this early, but in my experience, this works best for many reasons. First, it enables me to plant up as many of the seedlings as I want versus later, when all the roots are intermingling beneath the soil, they’ll get tangled and experience more trauma. Second, because it’s merely a long taproot, I have a good idea of where and how low the root goes, which helps me shove the chopstick in in the right place to loosen the soil all around the roots until the seedling is loose and simply lifts out. What you’re seeing is some dirt attached to a thin taproot. And because I know what formation I planted the seeds in, and one has its head sticking out already, I know where I can dig and mess around without affecting the other seeds or seedlings. Always grab the seedling by the stem/neck and not the leaf. I went back to the seed starting pot to pat down the soil around the emerging seedling and watered that back in, too. Carefully pat down the soil around the seedling. Don’t push down hard because that root is fragile, but tamp down enough to ensure that the soil is not still loose and empty where the hole was. Once the seedling is transplanted, you need to protect it from getting too cold (like sub-55), but you no longer need to keep it on the heating pad. Now, you do need to find a sunny, preferably southern window and put it as close to the window as possible. It matters less right now, but once the real leaves come in, it will matter. Once your evenings stay above 50 degrees (though I’ve put my seedlings outside when it’s 45 or higher), you can begin to accustom it to real outdoor sun. If your daytime temperature is above 70 with strong sun on a day, and you suddenly put your plant outside, it will disintegrate. If your nights get too cold suddenly, your plant will disintegrate. Remember that the darkest sun outside is still way brighter than any indoor window sun. Start the seedlings off in shade, then over a couple of days, move into morning sun for an hour and bring them back in. The next day, maybe 1.5-2 hours, and the day after, try 2.5 hours, and so forth — always ensuring your plants in nicely damp soil so they don’t wilt from being too thirsty. Both tomatoes and peppers need full, full sun in most areas, so plan accordingly. Furthermore, once they outgrow these cups, you’ll need 3-5 gallon containers for each pepper plant, and 7-10+ gallon container for each tomato plant, plus some kind of cage to help guide it upwards. The seed, the soil, and the effort up to this point is nothing compared the cost of the containers, fertilizer, cages, and other goodies you might want to use, like compost while planting. The costs do add up, and only if you grow over a full season eating every single pepper and tomato produced would you “save money” by planting your own peppers and tomatoes. Frankly, for my household, it gives me an opportunity to try new tomatoes and peppers; it saves me no money at all and gobbles up a lot of my time from spring to the fall. BUT it’s fun. It’s a lot of fun. So if you’re going to do it, you might as well do it right. And now, you have some idea of how to go about it. If you have any questions, leave a comment below. Good luck! And wish me luck that my tomatoes don’t melt before June! This is a KEH AGENCY website. Powered by Genesis Framework .